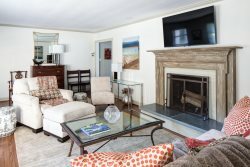 StayCharlottesville made renting the house easy. Thanks so much for all of your help! This Belmont house was absolutely perfect for a long weekend in Charlottesville. It is walking distance from dozens of great restaurants -- we had a hard time deciding where to walk for dinner! The house itself is beautifully appointed, and we enjoyed cooking breakfast in the sun-filled kitchen each morning. We can't recommend it highly enough! Your team is excellent. Hilary, who I probably talked to most was wonderful. There was an AC issue at Walker Square and it was handled immediately. I thought the property was excellent. Unfortunately because of medical problems which ultimately ended in Betsy's death we didn't get to use it for the intended purpose--house hunting in Charlottesville. I imagine I will want to use it again. I am in Bluebird on Lexington Ave. now and when that ends in January I may want to move back to Walker Square. Walkability is excellent. The Stay Charlottesville team are an absolute pleasure to work with. Caring, professional, and they really care about matching your personality and wishes to the best property. I'm a fan. Paradise Found. I love this cabin so much, I would live in it for the rest of my life if I could were it not for a pesky thing called "Getting a job to earn money." Every view from every window is breathtaking. And the setting - it's utter tranquility. I reached this cabin after ten years of living in Los Angeles in overpriced apartments with no sound proofing. This cabin restored my sanity and my zest for life. You should stay here. It really is heaven on earth. Love the view from the porch. We had everything we needed. It was well thought through. The office staff when we called several times were super! We had a great stay - really enjoyed 306! Very easy to work with -- very responsive by phone and email. Organized. Fantastic Weekend in Cville: Plenty of space for 6 people, nicely decorated home, great location walking distance to the downtown mall and Belmont neighborhood restaurants. Easy peasy! Couldn't have asked for a better experience. Can you recommend similar companies in other cities and towns? The property was absolutely wonderful! So unique, cozy, and comfortable. We were 1/2 mile from Main Street, and about 1/4 mile from Downtown Belmont. It was so nice to be able to walk to/from main attractions, restaurants, and entertainment. The property had everything we needed and more. We would love to come back! The team were amazing from the detailed instructions we received for our arrival to the promptness of answering queries. The apartment was clean, bright, spacious and well equipped. It was only a 10 minute walk to downtown in a quiet residential area which was ideal. We wouldn't hesitate to stay here again if we returned to Charlottesville. All was great while our stay in Charlottesville..